Originally published in Journal of Creation 11, no 3 (December 1997): 264-273. The existence of comets has long been used as an argument for a recent creation (probably the best treatment so far is that of Slusher1). The case is usually made as follows. The standard model of a comet is one in which all of the material observed is released by an icy nucleus only a few kilometres across. This model strongly suggests that comets are very fragile, losing much of their material during each close pass to the Sun. Most comets follow orbits that take them vast distances from the Sun. If a comet’s orbit takes it too far from the Sun, then the comet could easily be captured by the gravitational attraction of other stars and thus would be lost to the Solar System. This places a maximum distance from the Sun that a comet may orbit. If this maximum distance can be estimated, Kepler's third law of planetary motion can be used to deduce the greatest possible orbital period that a comet may possess (about 11 million years). When combined with an estimate of how many trips around the Sun that a comet can survive, we can estimate the maximum age of comets. This figure is far less than the adopted 4.6 Ga age of the Solar System. Because no source of creation for comets has been identified, comets are assumed to be primordial. If this is true, then the age of the Solar System must be less than the estimated upper age of comets. This has been recognised as a problem in astronomical circles for a long time. There have been several suggested resolutions to this problem, the most popular and successful being that of the late Dutch astronomer Jan Oort.2 Oort proposed a large spherical cloud of comet nuclei that formed early in the history of the Solar System. The Oort cloud is supposed to be at a large distance from the Sun, placing the nuclei too far away to be observed. The estimated radius of the cloud has varied over the years, and even from author to author. The inner cloud, where most of the nuclei reside, is believed to have a radius of 10,000 to 20,000 AU. An AU (Astronomical Unit) is the mean distance between the Earth and Sun, and is roughly 1.50 x 108 km. Estimates of the size of the outer Oort cloud vary, with a range of 40,000 to 150,000 AU from the Sun. At such great distances the temperature is so low that the nuclei can be preserved in a 'deep freeze' sort of environment so that they survive to today. Occasional gravitational effects of other stars, called perturbations, are believed to cause some of these nuclei to plunge toward the Sun and continue to orbit until they are exhausted in a time-scale much less than 4.6 Ga as mentioned above. Therefore this model suggests that all of the comets observed today have been in their current orbits for only a fraction of the age of the Solar System. The word ‘comet’ comes from the Greek komhth comètè (long-haired), from which we also get the word ‘comb’. Loosely, a comet appears as a hairy star. For millennia comets have been associated with disasters. Two examples are the apparitions of Halley’s Comet during the Battle of Hastings in 1066 and the destruction of Jerusalem in AD 70. Comets really do appear mysterious. While the stars, the Sun, the Moon, and the five naked eye planets all follow regular and predictable motions, comets appear suddenly, quickly move in an erratic fashion, and then abruptly disappear, apparently never to be seen again. Several models of what comets are have been proposed, but the standard model for several decades has been the icy conglomerate model, or the ‘dirty iceberg’ theory of Fred Whipple.5 The term ‘dirty iceberg’ refers to the nucleus, from which material is removed and caused to glow, making the comet visible. 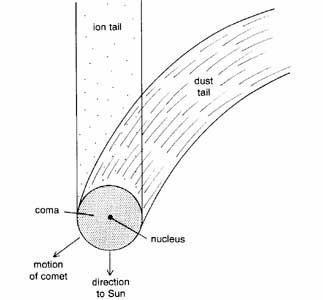 The nucleus of a comet is believed to be a mass of ice several kilometres across with an admixture of small dust particles (Figure 1). The ice consists of various frozen materials, mainly water, carbon dioxide, methane, and ammonia. At about 40 km in diameter, the nucleus of Comet Hale-Bopp seen in 1997 is one of the largest nuclei ever observed, which explains why it has been termed ‘a great comet’. For comparison, the bright Comet Halley has a nucleus about one fourth that size. When far from the Sun the nucleus of a comet is at a sufficiently low temperature for the ice to remain frozen, and thus the nucleus can exist indefinitely in this state. As the nucleus passes close to the Sun, the greatly increased radiation heats it so that the ice begins to sublime. The Giotto spacecraft passed close to the nucleus of Halley’s Comet in 1986 and revealed a surface as dark as coal. Presumably this is a crust consisting of carbonaceous dust left behind as the ice sublimes. A similar thing can be observed in winter in cooler climates where snow is ploughed into large piles in parking lots. As the snow melts or sublimes, dirt is left behind to form a dark crust on the surface. This dark coating allows for more efficient absorption of the Sun's rays so that the sublimation of ices occurs more rapidly. Before and during its first pass near the Sun a comet’s nucleus is expected to be lighter in colour, but the formation of the dark crust should make the nucleus darker on subsequent passes. As the gas is released it rapidly expands into an envelope up to tens of thousands of kilometres in diameter called the coma (see Figure 1 again). The Sun’s radiation ionises the gas, and the recombination of the atoms, along with the reflection of sunlight off dislodged dust particles, makes the coma visible. The coma is the brightest part of a comet and gives a comet its hairy appearance, but is very tenuous as shown by the fact that stars viewed through it are not appreciably dimmed. Subsurface sublimation results in explosive release of gas in the form of jets, which can cause large changes in the brightness of the coma. The solar wind shoves the ionised gas away from the Sun, forming an almost straight ion, or gas, tail (Figure 1). The Sun's radiation pushes the more massive dust particles outward, producing a more gracefully curved dust tail. Both tails point away from the Sun, whether the comet is approaching or leaving the Sun. This line of reasoning has caused a re-evaluation of the status of Pluto. Heralded as the discovery of a ninth planet and the perturber of Neptune's orbit in 1930, Pluto's classification is now in doubt. Even in 1930, it appeared to be too small to account for the alleged perturbations. The discovery of its satellite Charon nearly 20 years ago and the season of mutual eclipses of the two bodies in the 1980s have led to very good measurements of the sizes and masses of Pluto and its moon. The resultant densities are consistent with an icy composition containing an admixture of rocky material, the same as cometary composition. There is an attempt to reclassify Pluto and its moon as very large asteroids, or, given their orbit and composition, members of the Kuiper belt. This evolution has been reviewed elsewhere,22,23 and will be summarised here. Earlier the alleged evolution of the Solar System was outlined. In the planetary region, planetesimals were able to coalesce into planets and satellites. Beyond the planetary region the planetesimals failed to coalesce, perhaps due to the lower density present there. Like all of the other planetesimals, the distribution had flattened toward the ecliptic into a toroidal shape. Being far from the Sun, these planetesimals retained their volatile composition. In short, these unamalgamated planetesimals have the composition of comet nuclei, while their orbits have a distribution similar to the Kuiper belt. Thus the Kuiper belt represents the primordial population of comets. Other stars are now known to possess disks of material at similar distances or greater distances (examples are Vega and ß Pictoris). Witkowski, J.M., 1972. On the problem of the origin of comets. In: The Motion, Evolution of Orbits, and Origin of Comets, G.A. Chebotarev, E.I. Kazimirchak-Polonskaya and B.G. Marsden (eds. ), D. Reidel Publishing, Dordrecht, Holland, pp.419–425. Return to text. Whipple, F.L., 1972. The origin of comets. In: The Motion, Evolution of Orbits, and Origin of Comets, G.A. Chebotarev, E.I. Kazimirchak-Polonskaya and B.G. Marsden (eds. ), D. Reidel Publishing, Dordrecht, Holland, pp.401–408. Return to text. Stillman, W.E., 1990. The lifetime and renewal of comets. In: Proceedings of the Second International Conference on Creationism, R.E. Walsh and C.L. Brooks (eds. 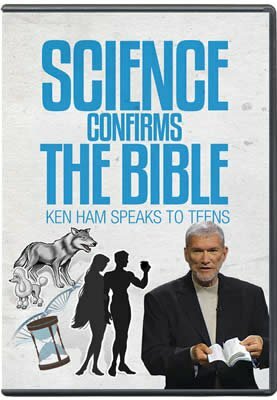 ), Creation Science Fellowship, Pittsburgh, Pennsylvania, Vol.2, pp.267–278. Return to text.